Fearless, the first Malayan tigresses captured on WWF-Malaysia’s camera-traps in Temengor back in 2007, was caught on camera-traps set up in 2009 to 2010. A Malayan tiger, fondly known as ‘Fearless’, is striving to boost the tiger population in Malaysia despite harsh conditions in Temengor Forest Reserve. This female tiger that has occasionally reappeared over the past 10 years has raised at least five cubs. 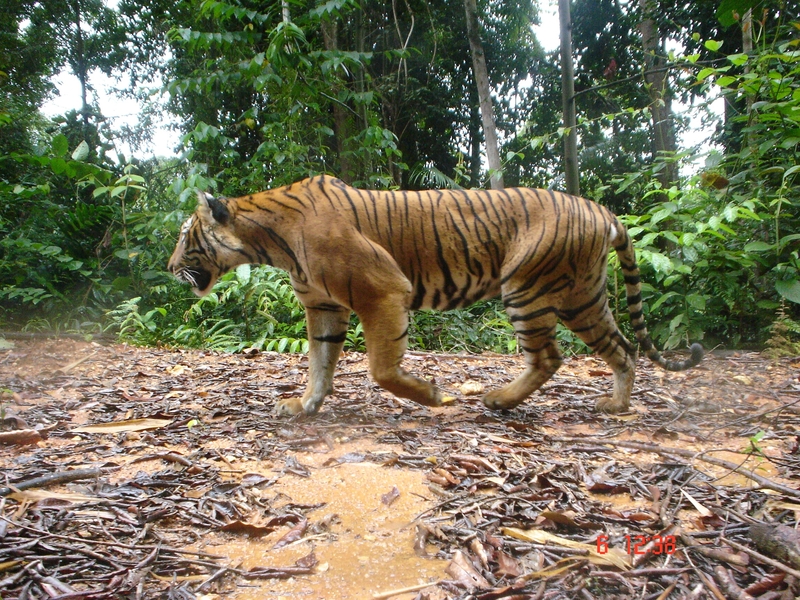 She is one of the first tigresses to be captured on WWF-Malaysia’s camera-traps in Temengor back in 2007. The organization’s conservation team named her Fearless, as she represents the spirit of a fighter. In a way, she embodies a warrior-like ability to survive in challenging conditions, while raising her cubs. 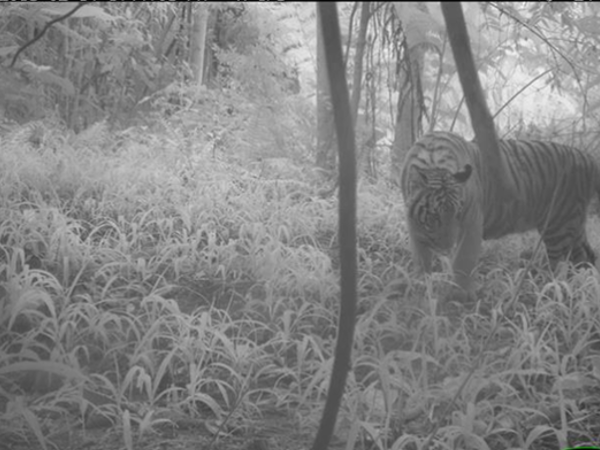 WWF-Malaysia’s senior wildlife monitoring officer Christopher Wong says, “Surviving in a production forest like Temengor is difficult, particularly for a tiger. In a production forest, some trees beyond a certain size are removed, food and other resources are scarce, and the canopy is sparse.” Apart from these existing challenges, there is also the critical threat of poaching and illegal wildlife trafficking that form major roadblocks in their survival. For example, the network of logging roads in production forests enables poachers to easily access the interiors via 4wd vehicles or motorbikes. After the first camera-trap photos back in 2007, Fearless reappeared in photos from WWF-Malaysia’s intensive surveys in Temengor from 2009-2010, but this time to the team’s delight, with two young cubs. 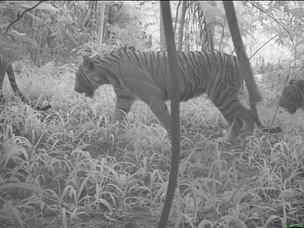 When WWF-Malaysia recently revisited Temengor Forest Reserve in 2015-2016 to start the next phase of camera-trapping, Fearless was once again caught on camera. Much to the team’s amazement, Fearless was rearing another three cubs! “With her age and the surrounding conditions, survival is already very challenging for an adult tiger; let alone one that is raising cubs,” added Wong. Tigers are solitary animals, so the responsibility of raising and protecting a cub falls squarely on the shoulders of the mother. Cubs normally stick to their mothers for the first two years before becoming fully independent. Until then, the tigress cannot bear another litter. Typically, the interval between births is once every three to four years for a tigress. Young cubs are particularly vulnerable as they are born blind. The tigress has to be with her cubs all the time for the first two months, as they feed only on the milk provided by the tigress. In fact, a tigress spends almost 70% of her time feeding her cubs for the first few months. Even though the tiger is an apex predator, the mortality rate of cubs is about 50%, which means only one out of two cubs typically survive into adulthood. Fearless is not the first female tiger to be caught on WWF-Malaysia’s camera-traps. Back in 2004 when WWF-Malaysia conducted their first ever tiger survey in Gunung Basor Forest Reserve, another tigress Emmelia, and her three cubs Love, Hope and Faith, were photographed. “Unfortunately, they have never been seen again”, shared Wong. History seems to be repeating itself with the first litter of Fearless, as they have not been captured by any camera-traps since they were originally detected back in 2009-2010. According to Wong, there are two ways to interpret this situation. In 2010, 13 tiger range countries came together and pledged to double the population of wild tigers from 3,200 to 6,000 before the next Lunar Year of the Tiger in 2022. The overall population of wild tigers worldwide has increased from 3,200 in 2010 to 3,900 individuals in 2016. However, Malaysia saw a drop in its tiger population within the same period; which underlines the importance of aggressively increasing tiger conservation efforts. In the past 50 years, tiger numbers in Malaysia have thought to have dropped from more than 3,000 individuals to the most recent estimate of 250-340 individuals. The Malayan tiger was reclassified from ‘Endangered’ to ‘Critically Endangered’ in 2015, meaning that it faces an extremely high risk of extinction in the wild. It was officially recognized as a subspecies in 2004. 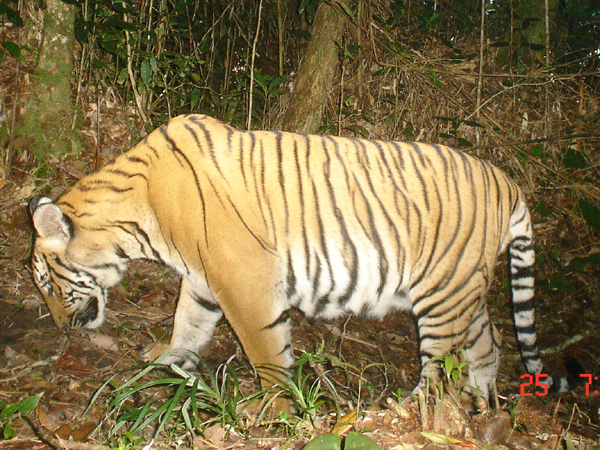 Although now grouped together as the continental tiger with other sub-species such the Bengal tiger and Amur tiger, the status of tigers in Malaysia remains critical. Tigers are an umbrella and cornerstone species, so protecting them can safeguard the balance of the forest ecosystem and, at the same time, protect other species within the ecosystem. 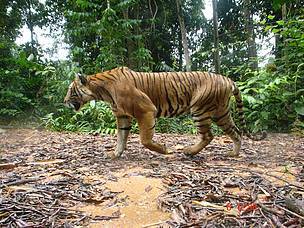 It comes as no surprise that tiger conservation is a priority for WWF-Malaysia. The organization is committed to increasing the number of wild tigers in Malaysia, to ensure the continuity and preservation of this incredible species. WWF-Malaysia’s key areas of focus include wildlife monitoring, supporting anti-poaching efforts and engaging with the local communities. WWF-Malaysia needs about RM10 million to fund wildlife conservation efforts every year. Fearless's first cub caught on camera-traps set up in 2009 to 2010. 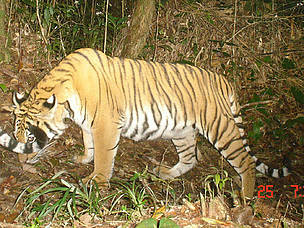 Fearless's second cub caught on camera-traps set up in 2009 to 2010. 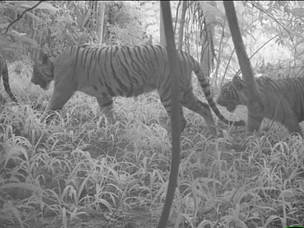 From camera-traps set up in 2015 to 2016, Fearless between her two cubs, only the tail of the front cub is in the photo. From camera-traps set up in 2015 to 2016, Fearless being followed closely by her cub. From camera-traps set up in 2015 to 2016, a third cub appears a few seconds later.